This morning I watched six mostly suburban teenagers introduce about 100 inner city fourth, fifth and sixth graders to jazz. The irony did not escape me—jazz, born in the cultural maelstrom of urban life, was now being reintroduced to its city offspring by its many generations-removed and far more privileged “country” cousins. 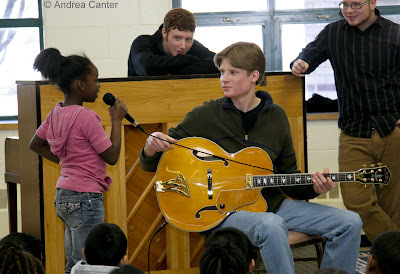 But it wasn’t irony that brought the Dakota Combo sextet to Richard Green Central Park School on Minneapolis’ near south side. The Combo was initiated in fall 2006 through the joint efforts of the Dakota Foundation for Jazz Education and the MacPhail Center for Music. High school jazz artists are selected through open auditions and spend the year studying improvisation and the art of ensemble playing under the direction of trumpeter/educator Kelly Rossum. The inaugural combo (a septet of mostly city students from St. Paul and Minneapolis high schools) performed at the Dakota Jazz Club with renowned guest artist, Bobby Watson, and later had a gig at the Nomad World Pub and a final set at the summer Twin Cities Jazz Festival. Now those musicians are pursuing music at such schools as Berkelee College of Music, Manhattan School of Music, and the Brubeck Institute. The new crop selected last September includes one student from Minneapolis South and the rest from such suburban programs as Apple Valley and Minnetonka. This year the program expanded to a full year of rehearsals, more performances, and a day of school visits. It was important to Kelly Rossum and to the Foundation that the Combo visit a range of schools, reflecting not only diversity in student age but in student circumstance and access to music education as well. Thus the day included the K-8 Richard Green program and Southwest High School in Minneapolis, and north suburban Spring Lake Park High School, which not coincidentally is the home school for the Combo’s drummer, Matt Roberts. It’s not a bad thing to have an opportunity to be a star in your own neighborhood. Green was the first stop of a long day. Jan Parrish, school principal, was at least as excited as the students to have her school selected for this program. “We just lost our instrumental music program,” she told me. “We had to fund more classes for ESL (English as a Second Language).” It’s tough for the language of jazz—or music generally—to compete with the need to learn the basic language of the classroom and community. But Parrish is determined to bring the arts in all forms into her school, even if not part of the regular curriculum. For as little as an hour, projects like the Dakota Combo help fill the void created by shrinking school budgets and declining enrollments. Parrish introduced the band and asked the students if they knew anything about jazz. Most likely, very few did, but what these kids lacked in experience they quickly deduced from observation—jazz must be “saxophones, drums, guitars.” “Is jazz art?” asked Parrish. They weren’t sure. Soon they had a good idea, as the Combo played the music of Charlie Parker and Charles Mingus, as well as a tune composed by bassist Corey Grindberg. Now they had questions, which the teen musicians fielded comfortably, warmly. “Can you sing?” (a resounding “No!”)… “How long did it take you [Corey] to write that song?” (“Five minutes.”) And to the delight of their attentive, nearly squirm-free audience, the Combo musicians each offered a quick lesson in the virtues of their instruments, complete with demonstrations. And they got a bit competitive, Stephanie pointing out that the sax did not need an amp like Geoff’s guitar, Jake pointing out that his trumpet could play much louder and much higher than Stephanie’s sax, Matt boasting that he could get lots of volume from his drum kit without any microphone. Each demonstrated what made his or her instrument special. Clearly they all were treasures. It seemed that a week’s worth of attention and wonder went into that forty minutes. “So what did you learn about jazz,” asked Principal Parrish as the Combo students ended the first leg of their “tour.” “There’s lots of instruments.” “Jazz means you can mix it up with anything.” And is jazz art? Oh yes. We surely need to fund ESL programs in our schools, because so many of our children are immigrants whose only chance of success is fluency in English. But why should learning English cost them the opportunity to learn music?